On Sunday, the Federal Opposition leader Bill Shorten announced that if the ALP are elected at the next federal election, they will match the $300 million the state government has committed towards design and planning for its signature re-election promise, the Suburban Rail Loop. Meanwhile, the public transport election stakes keep rising with the Andrews Government unveiling a plan to electrify Wyndham Vale and Melton lines, while at the same time increasing track capacity to allow more regional express trains to run to and from the city to Ballarat and Geelong. 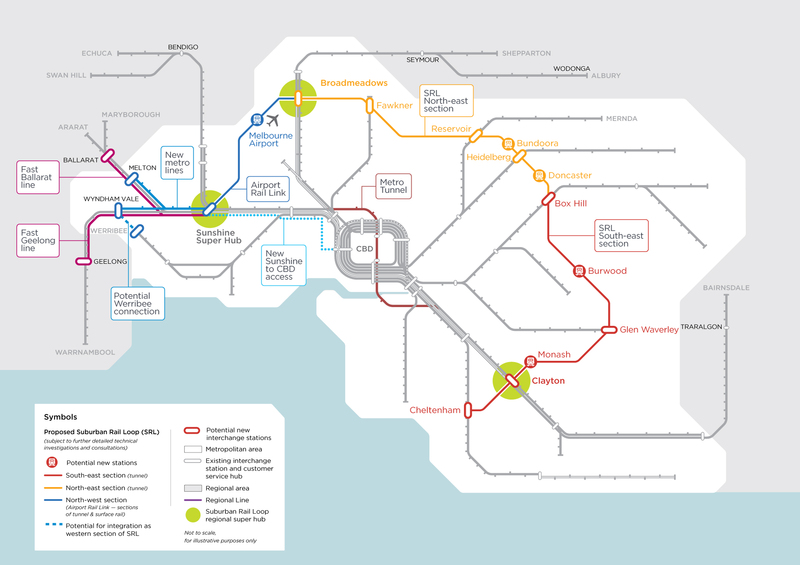 The Suburban Rail Loop is a proposal to build an orbital rail line linking all existing railway lines (except Sandringham and Alamein) at key points around the middle ring of Melbourne. Likewise, it aims to put Monash University's main campus in Clayton, Deakin's primary Melbourne campus in Burwood and La Trobe University's main campus in Bundoora directly on the rail network. When the Premier and Public Transport Minister, Jacinta Allan, showcased the Suburban Rail Loop for the first time, a handful of estimated journey times were released. More estimated trip times emerged from the media conference held in Box Hill on Sunday. 25 minutes from Clayton to Bundoora. 25 minutes from Box Hill to the Airport. 35 minutes from Broadmeadows to Monash. 45 minutes from Cheltenham to the Airport. 15 minutes from Box Hill to Monash. 25 minutes from Broadmeadows to Deakin in Burwood. 20 minutes from Heidelberg to the Airport. 35 minutes from Glen Waverley to the Airport. The Premier was in Geelong on Tuesday morning to announce another rail-focused election commitment that would include extending metro services to both Melton and Wyndham Vale as well as provide extra track from the city to enable faster regional services to run from Geelong and Ballarat to the city. The plans for the western section of the Suburban Rail Loop have become clearer with a video posted on the Premier's Facebook page showing the Werribee Line extended to Wyndham Vale, which in conjunction with the extended metro services, would form the western section of the loop. Adding to all the other rail commitments, which have focused on planning, other media outlets are reporting $150 million will be spent on expanding railway corridors to Wyndham Vale and Melton that presumably will be quadruplicated allowing metro services - which are stopping-all-stations in nature - to be separated from V/Line express services. According to information now available on bigbuild.vic.gov.au, it is anticipated 'the three major network changes would be undertaken in stages and take around a decade to complete.' Much of the planning work will be completed as part of the Airport Rail Link business case which is now due to be completed 'in 2019/2020'. I should have noted this in the article above, however the Airport Rail Link section now shows Sunshine-Airport-Broadmeadows.